The young company “Fazenda Amazonas” (translated “Amazon Country Estate”) was founded by the Brazilian entrepreneurs Aline Girardi e Suzi Cocenza in the city of Rio Preto. 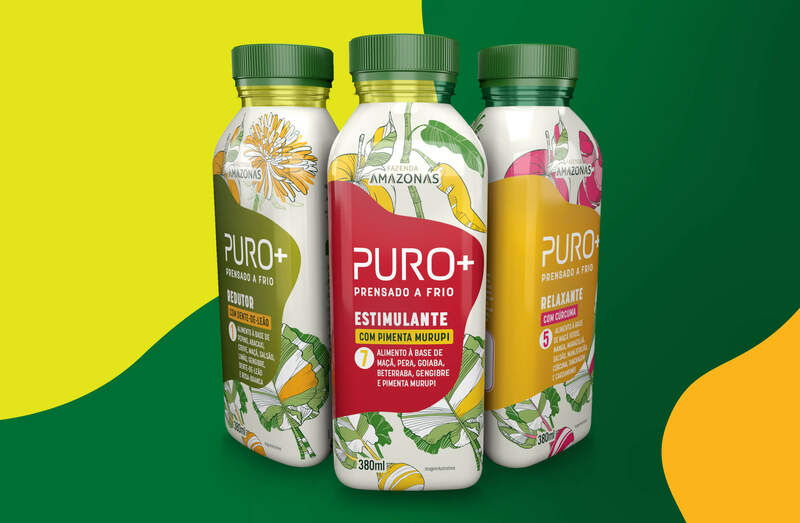 With its brand “Puro+” – in German “Rein(heit)+” – “Fazenda Amazonas” focuses on an innovation in the Brazilian beverage sector: Puro+ is the first brand to focus exclusively on cold-pressed juices. 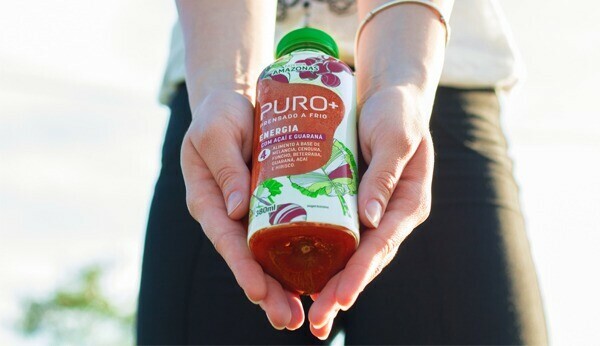 In addition, the juices are enriched with active, natural superfood ingredients from the Amazon ecosystem. In recent years, superfoods have also experienced a strong increase in popularity in Brazil. For Brazilian consumers, health, a healthy lifestyle, fitness and vitality are outstanding trends that are also being sought through food. In 2016 alone, this segment had a turnover of more than 27 billion dollars, with a growth rate of 10% over the previous year and bright prospects, as the market is still characterized by a very low penetration rate. 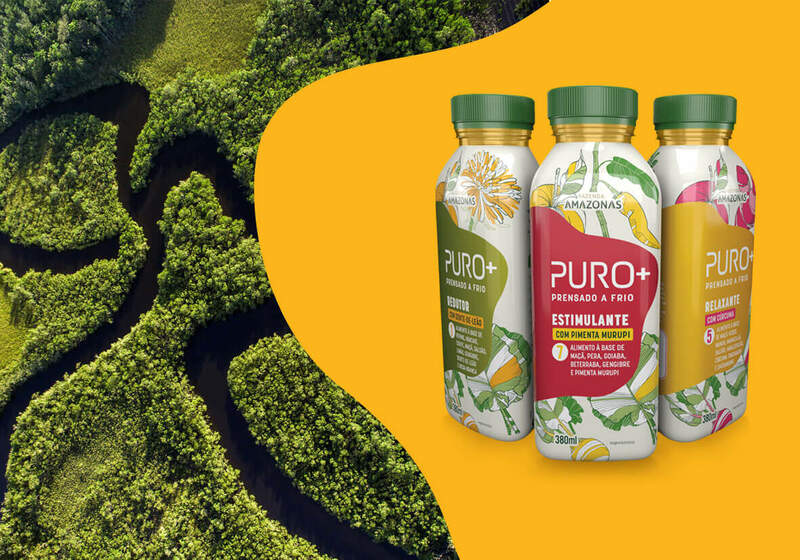 The company turned to glba-Sao Paulo in search of the perfect visual identity for the Puro+ beverage line. The agency examined the market segment, developed a brand strategy and developed a holistic packaging design based on a proprietary visual universe. It is characterised by the harmonious balance between the codes of the different flavours and the innovative approach and purpose of Puro+. glba-Sao Paulo (alias A10) chose the triangular shape as the central design element. It is innovative and eye-catching and symbolizes the inextricable connection between the individual, nature and life. The pictorial world is determined by organic structures and the natural forms of movement of nature. The palette of colours used is composed of earth tones, as they can be found in the Amazon region. Illustrations of the respective superfood additives in the juice convey the “plus” of the respective flavour to the consumer in an attractive and unambiguous way. As a result, “Fazenda Amazonas” was delighted with a design that combines nature, health and design and identifies the product as both “premium” and “natural”. The acceptance of the target group has been very high since the market launch and leads to sustained monthly sales increases of 30%. As a small plus, the visual identity of the Puro+ juices developed by glba-Sao Paulo / A10 received the award of the “Brazilian Graphic Design Biennial”. Margot Doi Takeda is a passionate and studied art director and designer with more than 30 years of professional experience. After working in some of the best known Brazilian agencies like DPZ and DM9, Takeda founded her own agency in 1997: “A10 – Ideen die Verändern”. Margot Doi Takeda was a juror for many Brazilian design awards, the Cannes Lions and Chair of the London International Advertising Awards. A10 is a design and brand consultancy founded in 1997 in the Brazilian capital Sao Paulo. Its work focuses on ideas that change businesses, products, markets and perspectives – and deliver concrete results. A10 promises added value for clients through the creativity and entrepreneurial vision of an interdisciplinary team of top professionals and a strong network of partners. The Global Local Branding Alliance (glba) is a global network of leading packaging and branding agencies. 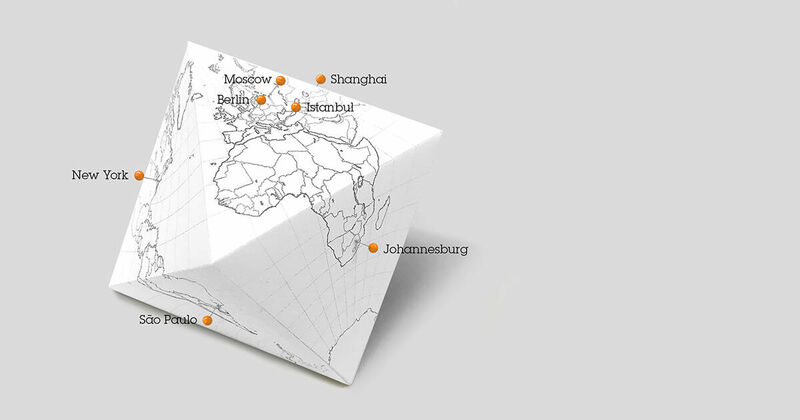 The network was initiated in 2013 by the Berlin agency Berndt+Partner and has partners in Shanghai, New York, São Paulo, Johannesburg, Istanbul, Moscow and Berlin.